In the Barcelona Pavilion at the International Exposition in 1929 the white Barcelona Chairs were the chairs of choice. If you value the historic value of this piece of design and thus its character, you’d go for the white Barcelona chair. Other people who choose for white are fan of a white, modern and pure interior. Just like black, white officially isn’t a color. It’s the presence of all colors in the spectrum. White goes well with all other colors and brings light into your home. The Barcelona Chair is available in many different models. You can choose for the lounge chair itself of course, but it’s also possible to go for a set: a lounge chair plus an ottoman. The ottomans are also available separately. Want to do it big? Go for a two-seater version of the Barcelona Chair, or go for a daybed! Combining different chairs is definitely worth it too! How beautiful would a lounge area filled with Barcelona Chairs be? Or a white set of Barcelona chairs and one Barcelona chair in a different color as an eye-catcher? Whatever option you choose: with this chair you can’t go wrong. Buying a Barcelona chair is a choice you won’t regret. You’ll enjoy this chair for the rest of your life, and if not: you won’t have to sell it for less than you bought it for. It’s not a fashion piece or a season-sensitive item, nor is it a practical chair from the IKEA. It’s timeless design of the highest quality. Now that you’re considering a white Barcelona chair you might be thinking: how long can I keep my white Barcelona Chair actually white? The answer is very simple: for a really long time. Because the chair is made of white leather you can easily just wipe off anything that gets on the chair. And as we all know, leather only gets more beautiful when its used, even white leather. The original white Barcelona chair can be bought at Knoll. But, when you buy at Knoll, keep in mind that they bought the rights to sell this chair and it isn’t the actual original design. Knoll changed the dimensions of the chair slightly. 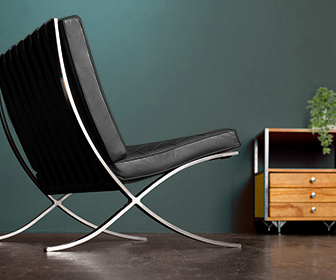 Would you like to buy a Barcelona Chair but think it’s just a bit too expensive? Then we can highly recommend you to buy a replica of this chair. When choosing a replica keep an eye out for reviews of the chair or the shop where you are buying, because some shops use some really weird tricks to lower the cost of their chairs (hollow frames, cardboard filling). Our favorite store to get replica Barcelona chairs is BarcelonaChairShop.com – we never experienced anything weird cost-lowering tricks with their chairs!